Since I’m awake anyway, and my cat is giving me dirty looks for keeping him awake (um he’s the one that woke me up in the FIRST PLACE at 2:30 AM!) I thought I might as well post a blog that I’ve been wanting to post. I don’t have a lot of photos, and I’m going to do this by memory, because I haven’t had enough tomatoes to can this year (YIKES!! I KNOW!!). I have, however, been freezing fresh peaches, which right now, I have a love/hate relationship with. They’re the kind of peaches that the pits don’t come out easily, that’s bad-but the pits are small, that’s good!. The flesh is pretty dense and very sweet, that’s good! But the skin doesn’t like to peel off very well, that’s bad. So. I’m having quite a time of it. I have to only do an ice cream bucket at a time or I’ll have a small nervous breakdown. *NOTE: these are basic tomatoes. No funny stuff. No peppers or onions or anything else. This is straight up canning tomatoes. Adding other veggies changes the pH in the jars and affects the acidity of the tomatoes, so you will need to change up your recipe a little if you add these things. And whatever you do NEVER EVER add oil to your tomatoes for canning. NEVER!!! SPACE for your jars to rest after their bath. This may take a bit of space because you don’t want the jars to touch. OR if you want to skip the whole peeling part, and you are wanting more of a tomato puree, my friend Ann suggested THIS little beauty! You need a lot of tomatoes. Usually a bushel at a time if you’re buying them. Beg your friends, your family, buy them at the farmer’s market, steal from your neighbors (no, I don’t advocate stealing. Unless your neighbor told you to take what you want because they have a plethora of tomatoes and have already canned four dozen quarts then it’s OK because you have their permission – they’re blessing to steal.) 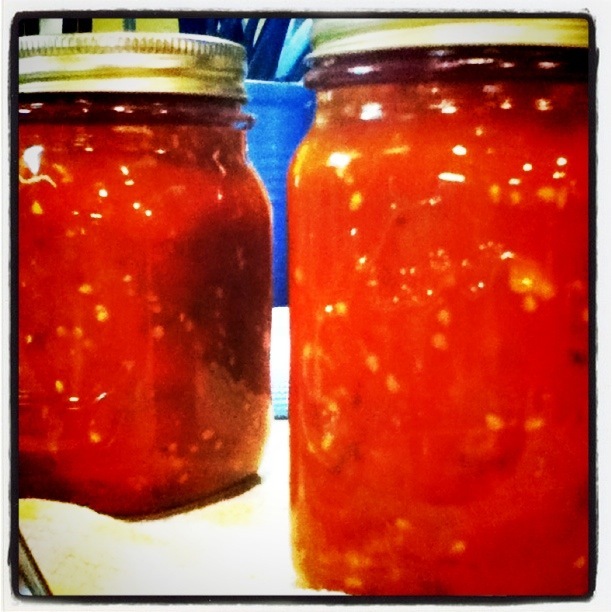 Get the “ugly” tomatoes for canning, but just make sure they’re free of mold and bugs. Usually the “ugly” tomatoes taste the best, because they’re REAL tomatoes. They’re lumpy and bumpy and can be difficult to peel, but they have the best flavor and NOTHING beats homegrown ugly tomatoes. 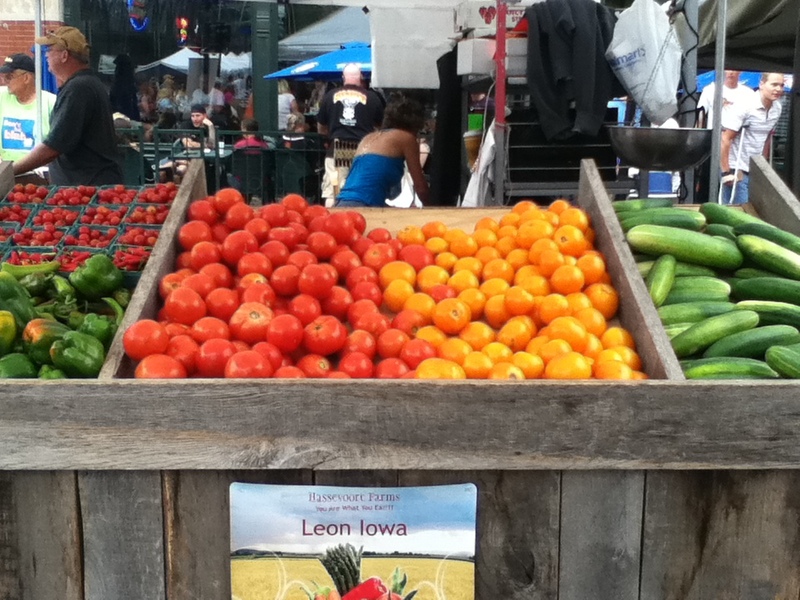 Most marketers will have the pretty tomatoes out front, and you have to ask for the uglies. Which is sad really. Anthropomorphizing tomatoes at 4 AM, it’s what I do best. Split tomatoes with black in the splits are completely fine to use, it’s the tomato’s way of healing and keeping it’s inner being healthy. So long as it’s not moldy or squishy (in which case, just toss the tomato,) just cut them out before you put them in the boiling water for blanching. Here’s the thing I’ve learned about jars. Not all jars are created equal. Humans, yes. Jars, no. GET CANNING JARS. Not used mayonnaise and pickle jars. And there is absolutely no need in the world for small mouth quart jars. None. So first, decide if you’re going to want quarts (for use in things like spaghetti sauce, chili, goulash) or if you want pints (for use in those same things except a smaller portion.) Pints are nice if you have a recipe that only calls for one jar of tomatoes and they have less waste. You can buy jars in packs of 12 with lids and everything in the package just about anywhere for between $9 and $12 at least here in Iowa. Even Target sells (expensive) decent canning supplies. Best bet is to look at a farm store, they always have everything you need. If you have jars already, make sure they’re free from chips, especially around the top, or anywhere that will make the jar vulnerable or cause the seal to fail. You can not reuse the seals to seal in canning once they’ve been used. The rest of the stuff is pretty self explanatory. If you don’t want to go out and buy all the gear for one batch of tomatoes that you were suddenly overwhelmed with, you don’t have to, but it sure will make your experience a better one with less burnt didgets. A friend told me that the county extension told him that Canning is a science, not an art (after a botched experiment canning pesto and botulism – fyi – you must freeze pesto never ever ever ever ever can it). So we know that A. you’re not putting any oil in the tomatoes, RIGHT?! and B. You’re just canning straight up tomatoes, you can add the other stuff later. So our acidity (so long as our tomatoes are relatively fresh) should be high enough as to not necessitate any additional acid. But what can it hurt? (PS. they don’t really need to be “preserved” with salt, either. But it does add flavor and meh, again, it doesn’t really hurt). Start a kettle about half filled with water to boil on the stove. Start the other kettle about the same or a little more This will be your blanching pot. First and foremost (and the part I hate the most,) prepare your jars. My mom used to empty the dishwasher and put all her jars in the dishwasher and start it before we even had the tomatoes cleaned. Most dishwashers nowadays have a sterilize cycle. Yeah, you can do that if you want. 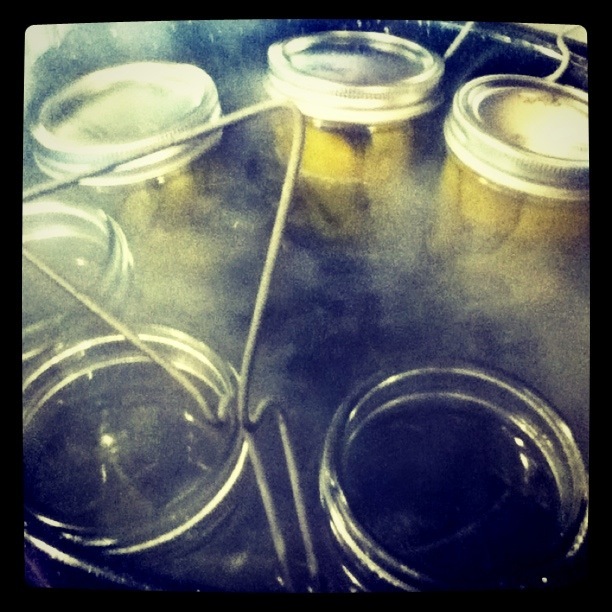 You want your jars to be hot and sterile when you fill them (sounds like a page right from 50 Shades of Grey up in here! WHOO!) If you don’t have a dishwasher, just hand wash your jars first, then place them into the hot water bath/rack on the stove until you’re ready to use them. While your jars are in the dishwasher, and your water is on the stove trying to boil, clean your sink, rinse it well, preferably with a non-toxic cleaning agent..(like melaleuca,norwex, or vinegar and water or a light solution of bleach and water). After it’s rinsed well, fill the sink basin with cold water (add ice just before you start putting tomatoes in). This will be the second part of the blanching where you shock the tomato to get the skin off. Also, so you don’t completely render your hands useless from third degree burns. Look over your tomatoes, remove any that are mushy and/or moldy. It kills a little piece of us inside to throw away or not use a tomato that *half* might still be good, but don’t use it in canning. It’s not worth it. If half is still possibly good, than eat it fresh if you want. But don’t use it in canning. Wash your tomatoes and remove the stems. You will core them when you put them in the ice bath. The core helps keep the tomato together, but you want to remove the core before you cook them. If there are small yucky parts, or ugly parts, like the photo above, you can remove them, but dont’ take half the tomato or you’ll lose all the tomato in the water. Your water is boiling, your tomatoes have been cleaned and washed and all the yucky parts and stems have been removed. Now gently lower the tomatoes (no need to score) into the boiling water (boiling – not just hot. Gentle boil is OK.) Don’t pack it full, just add them until they fill the space around the kettle. Now sit and watch. As the tomato heats up, it expands, causing the skin to eventually split. Kinda like my jeans. Once that happens, you can remove the tomato and put it into the ice cold bath. Usually it takes a good 10 minutes if you’re using big tomatoes, but it varies with the kind of tomato, so just let your eyes be your gauge. Let it sit for just a little bit in the ice cold water then remove the core (I usually cut the core out in an inverted cone shape) peel the skin off and place the tomato into a colander or another bowl. I do this in batches because usually, they start to split about the same time. Once all the tomatoes are peeled, cored, and in a separate bowl or colander, you can now place them back into a clean stock pot to boil them down. Let them cook for a good 30 minutes or more, stirring gently frequently, until they start to boil. 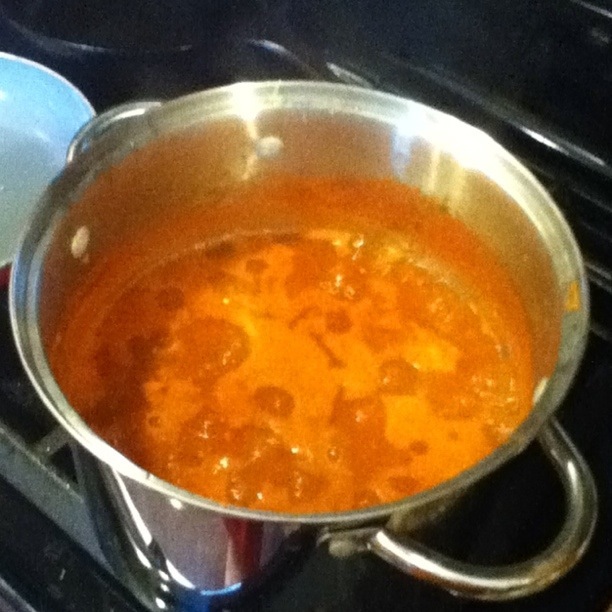 While your tomatoes are stewing, start the small sauce pan filled with water to boil and add your seals. so they are nice and soft when you’re ready to use them. Now you can relax a little bit and finish getting things set up if necessary. 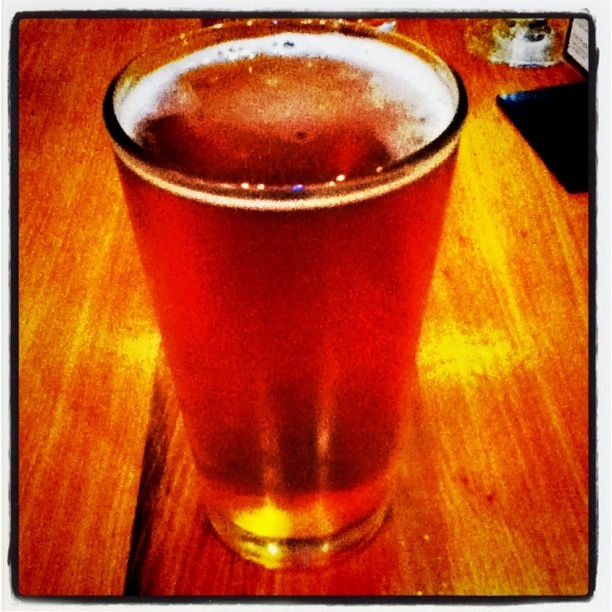 Here, have a beer. You’re welcome. So the tomatoes are done and you’re ready to fill jars. Your dishwasher should be done running by now. Or if you don’t have a dishwasher, leave your jars in the hot water until you’re ready to use them. Now here’s where it gets tricky. I always put the salt and/or vinegar or citric acid (if I’m using it) directly into the cooking pot. Canning websites say to put the salt and citric acid into the jars, I suppose to ensure that each jar get an equivalent amount. Makes sense. Do what you want. 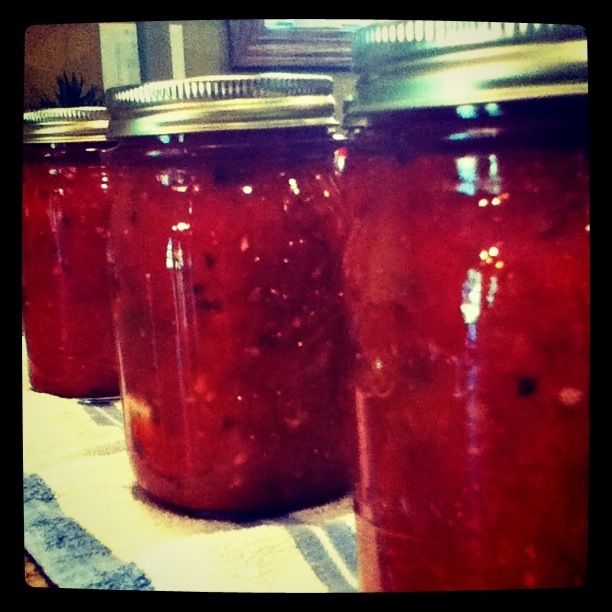 I’ve been canning tomatoes for 20 plus years and I’m still alive. If you choose to put your citric acid into the jars, according to the Food Preservation portion of the Iowa State Extension Website, you can add 1/2 teaspoon citric acid per quart or 1/4 teaspoon per pint. You can also use lemon juice (yuk) or 5% vinegar at the ratio of 4 tablespoons per quart. I *personally* don’t use either. But it’s better to be safe than sorry. And personally, I’d stick with the citric acid because it won’t change the flavor like the lemon juice or vinegar might. To add the salt, use 1 tsp per quart or 1/2 tsp per pint. Once your tomatoes have been cooked down and are boiling at a good clip, you can remove your jars from the dishwasher, prepare them by adding your acid and salt. Then when you’re ready, take a deep breath, (and maybe grab an extra set of hands if one is handy) and start filing your jars. Insert your funnel and gently pour the tomatoes into the hot jars, leaving about 1/2 to 1/4 inch head space. Clean the top of the jar, remove your seal from the little pan, pat it dry with a clean towel, and place it on the jar, gently turn the ring until it is in place (you don’t have to Mike Tyson it, just twist it until it’s in place. Leave a little room for expansion.) Set the finished jar aside. Make sure wherever you place your jars, that they are not touching or they will crack. And that would be a tragedy. Once they’re all done, grab a glass of wine and listen for the delightful PING! That signals that your jars are cooling perfectly and sealing. Happy! I don’t typically use a hot water bath for tomatoes. And if you’ve added the acid, well..it’s not really (IMO) necessary. The hot water bath kills off any bacteria that might be lingering in your tomatoes. But chances are, you’ve cooked it out already, and you’ve pretty thoroughly cleaned your equipment and fruit. Right? And unless you haven’t cleaned things appropriately and you’re food or equipment has come into something filthy, like a child’s hand (or my children at least) I don’t think it’s necessary. And honestly, your kids should be somewhere else while you’re canning until they’re old enough to stay out of the way. What with all the knives and hot boiling things and glass and all. I think canned tomatoes will last for a couple of years, though ours never stick around that long. A year at most. Good luck, Godspeed, and enjoy your summer all winter long.